– Rinse quinoa until water runs clear and combine in a medium sauce pan with water, coconut milk, and dates. – Bring to a boil, then reduce heat to low and simmer for 15 minutes, or until quinoa has started to soften. – Add cinnamon, nutmeg, cardamon, pepitas, shredded coconut and golden raisins. – Cook an additional five minutes, adding water if necessary, until quinoa and soft and fully cooked. 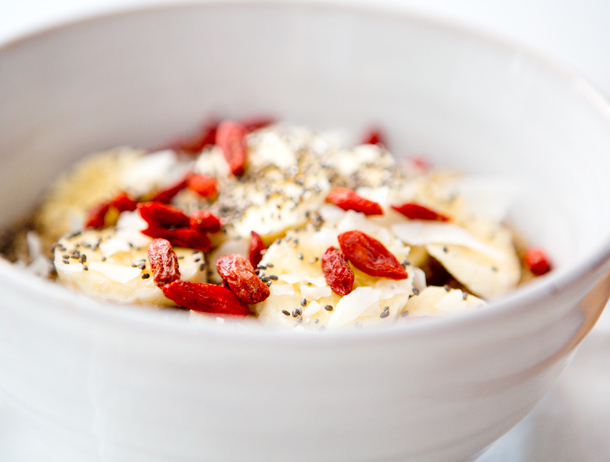 – Serve hot and topped with banana, goji berries, chia seeds, and coconut flakes. Add maple syrup or honey to sweeten further if you’d like! I have a small obsession with Quinoa.. almost every recipe I've posted on the blog involves it. Its so versatile and yummy! this looks amazing – i will definitely have to try. looks like quite the refreshing breakfast! i can't wait to try it! I bet the quinoa tastes great cooked in coconut milk. The sweetness of the coconut milk would be a nice balance to the slightly bitter quinoa. I haven't had goji berries in a while, but I love the colour that they add to those photos! Wow!!! This looks like the perfect, balanced power breakfast for fall… well, all year round for that matter! Thank you for sharing it here, i look forward to giving it a try! This looks delicious! Salivating as I read it. Just made this! Amazing! I added a little bit of canned pumpkin and pumpkin spice instead of the banana. Delicious! 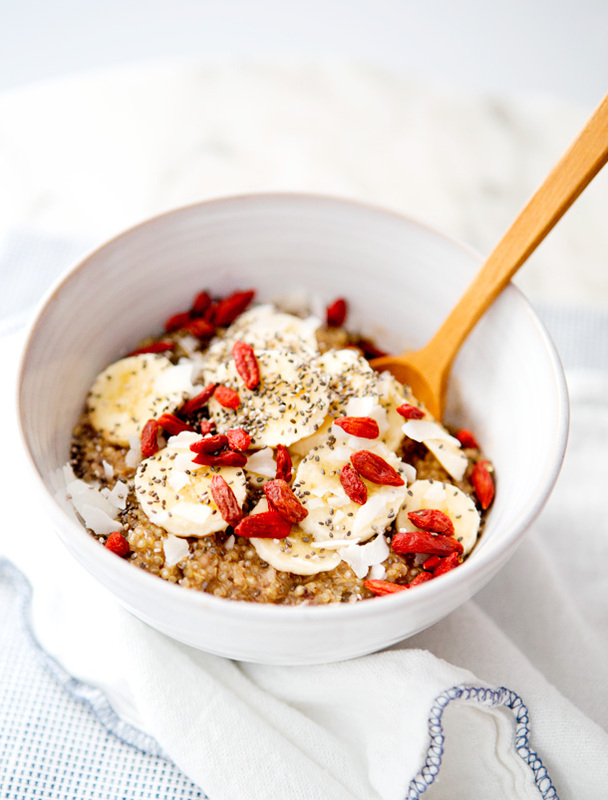 this is great – I recently switched from steel but oats in the AM to quinoa – I love it and top it with banana and some other stuff like raisins and dried cranberries. Super delicious and healthy.